At Ecard Shack, your business Holiday ecards are fully customizable with our quick and easy to use on-line design tool. Browse, preview and the select from the comprehensive range of professional images, animations and music tracks. Our standard holiday ecards are great however sometimes some of our clients are looking to make a bigger splash and hence our custom ecard options meet their needs. Take a look at our range and get in touch to discuss further. Why don’t you send your staff or clients an electronic game this holiday season? Our games can be branded in your name and ensure that your business is at the forefront of peoples minds into the new year after playing all of December. See for yourself how quick and easy it is to create the perfect corporate ecards with our online design tool. Many corporate holiday ecards suppliers take on your requirements and then weeks later deliver a solution that isnt quite what you envisaged. At Ecard Shack you will remain in full control and enjoy doing so. Browse, preview and then choose your animated corporate ecards design from our wide ranging portfolio of professional business holiday ecards. We’ve dozens of great tracks to accompany your holiday ecards for business, whether you prefer classic or contemporary and upbeat. Choose no music if you prefer. There is so much choice to enrich your corporate holiday ecards. Add a logo, compose a message, choose animations, change typeface, add your signature … somebody stop me! 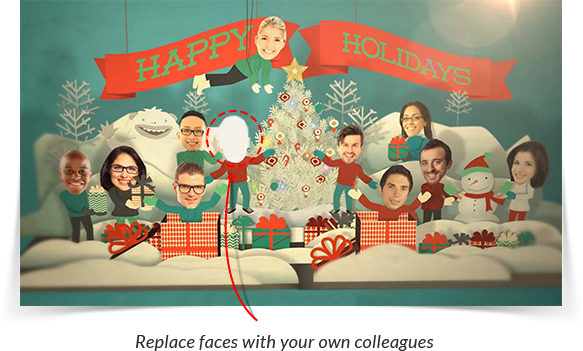 Sending your corporate Christmas ecards couldn’t be easier. When you are ready we guide you all the way and show you how to send via email. Or, ask us to send it for you. Christmas, New Year, Thanks Giving and more. Whatever you are looking for you will find it at Ecard Shack. Each design is animated to bring a smile to your customer’s face. Browse the examples below or check out our full portfolio of holiday ecards for business now. Do you need bespoke corporate Christmas ecards? Do you want to include your own photographs and images into your ecards? We can do that. How about a completely different design that plays as a video and you can you supply pictures of you team or products? We can do that too. Have a look at some of our samples and get in touch to discuss your needs.